The Frugal Family Life: $.55/1 Rayovac Coupon! We can never have enough batteries around our house! With all of my girls' toys, and of course, the remotes we find ourselves needing them often! 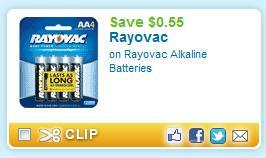 Print this $.55/1 Rayovac Batteries coupon. It will double at stores that allow, giving us $1.10 off! That should make for a nice deal!